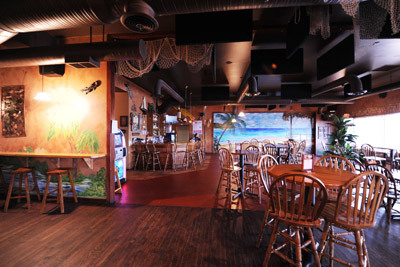 About Us - The Lazy Chameleon - Best Seafood and Margaritas in Columbus! The Lazy Chameleon was developed in 1997 for people and by people who love the thought of being able to have a fantastic meal in a comfortable atmosphere. Just like you, we also have changed over the years. What started out as a small neighborhood bar and grill that dabbled in live music, has now become one of the very best venues in central Ohio to see outstanding live music in an outstanding atmosphere. The Lazy Chameleon isn't for everyone. You have to like to have fun, be comfortable, and enjoy socializing. The name comes from the mindset that when you walk into the Lazy Chameleon you can change your colors so to speak. We specialize in great seafood, outstanding live music, and extremely friendly service. People ask is the Lazy Chameleon a restaurant or bar? Well, its both and a whole lot more. Enjoy the site, check out the menu and the entertainment that is upcoming. For the Third year in a row we were nominated for "Best Seafood" and "Best Margaritas" by citysearch. Thank you for voting for us. Its an honor to be nominated ......Thank You Powell!!! !